3D Laser Scanningis fast becoming the industry norm for precision surveying in high precision and high value technical environments. As one of the first companies to adopt Laser Scanning technology, we are one of the most experienced. Scan to BIM is a newly added service in CAD Outsourcing that are gaining a lot of accolades as it is the part of one of the requisite service of construction field i.e. BIM. We wish to taste the same quality for our respective user and client. For more information, assistance or quotation, please refer our contact details. We are looking forward to make a healthy business association. 3D laser scanning, the process of converting physical objects into precise digital models, enables you to quickly and accurately capture your object’s shape and geometries. We have state of art Germany make 3D Scanning Machines. 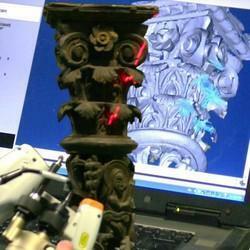 Have Blu, White Light and Laser 3D Scanning Machines.Have scanning accuracy within 5 microns. Have state of art CAD design facility with required domain expertise and skill sets. Have developed data across domains ranging from castings, sheet metal, platics across auto to medical and agri field. We offer our services in Chennai & Coimbatore. Matching up with the ever increasing requirements of the customers, our company is engaged in providing Laser Scanning Inspection Service. We have 2 Nos ROMER 2.5 Mtr Portable CMMs coupled with Perceptron V5 and Hexagon 20.8 Laser Scanners. We can 3D Scan any objects from the samllest size of 50 mm to as large as 5 mters. Being one of the best companies, we are presenting 3D Laser Scanning Services to our cherished patrons. This service is implemented by experienced personnel using avant-garde techniques. Offered services are highly demanded among our customers. We offer this service as per the demands of our patrons within a postulated time. Our patrons can buy this service at low-cost rates.